I've been consistently blogging for nearly six years. What started as a hobby to keep me busy when I was living alone for the first time in Boston has turned into a nearly full time side project that has kept me motivated through every training cycle I've been through and led to incredible friendships with people I never would have met otherwise. I thought it would be fun to look at my blog 'through the ages' to see just how much things have changed in these last six years! I hope you enjoy this little walk down blog memory lane as much as I have! It wouldn't be right to start with anything other than my first post or the list that started that drove my blog's name at the time - 25 before 25. I ran my first half-marathon in Boston and signed up for my first marathon right after I got home. I wrote a letter to New York when I started to realize that my love/hate relationship with the city was leaning more toward the latter. I wrote "the story of us." I took a solo trip around the world with stops in Sarajevo, Belgrade, Rome, and finally, India. Once I turned 25, it was time to change my blog's name. I graduated with my Master's. The Pilot and I moved to DC. A few months later, I went out for a run and my knee gave out, signaling the beginning of the IT band injury that would plague me for the next two years. Six months after we moved to DC together, The Pilot took me by complete surprise and asked me to marry him. I almost quit running after one year and two rounds of PT hadn't helped me. Two weeks before we got married, the nonprofit I worked for went through a merger and I was laid off from my job. The Pilot and I were thrown into married life...before we were even married. But we did get married. I never did quit running and after two years of being hurt, I finally made my marathon comeback in Chicago. There you have it. 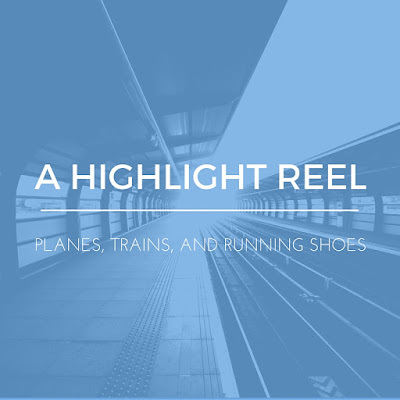 My blog's little highlight reel. It's been fun to look back on what I've documented in this space over the last six years and I look forward to seeing what makes the highlight reel in 2016!